Is your file cabinet bulging with another year’s worth of tax documents? Are you keeping every single bill, tax return, insurance invoice, medical documentation, contract and even the warranty for that 15-year-old coffee maker you don’t even own anymore? If you answered “yes” to any of these questions, you are not alone. Many people are not sure how long to retain their financial records. With the threat of identity theft coming largely from paper documents it is good practice is to shred all the records you should no longer retain, especially those with your personal information. Expired documents can pose a threat to your financial health and may not provide you with any useful information. At least once a year you should go through your files and shred everything that is no longer needed. With this volume of shredding you should consider using a shredding service. A personal shredding service like Ship ‘n’ Shred or mobile shredding can save you from wasting a day burning up your personal shredder and is very affordable. 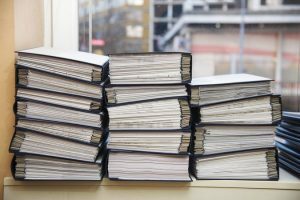 When it comes to personal records retention guidelines, there aren’t any hard and fast rules but these are some basic guidelines for the retention of your personal records. Shred Nations specializes in helping you find the right shredding service. To get started, fill out the form to the right, or give us a call at (800) 747-3365. Within minutes of receiving your request, you will receive quotes from local providers so that you can select the company that fits your project best.